When I am asked, “How long are you staying here?” and I answer, “About three months.” I get an immediate reaction of “wow.” Three months is a long time, and just so happens to be the same amount of time needed for me to become “comfortable” in a new city. I have lived in four different cities now, and have developed a system to quickly learn to navigate. At first, everything is new and it is a task to get anywhere. Planning is required. You have to pay attention at every corner. 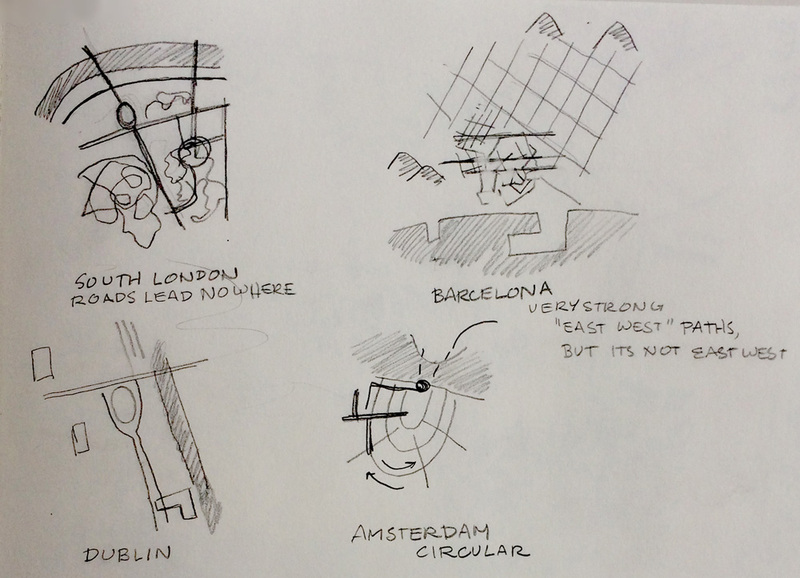 So I wouldn’t forget my early mental maps, I documented them for the first few days in Barcelona, Dublin and Amsterdam. I would draw these maps in the morning, while drinking coffee, before leaving the apartment. The sketchbook was the only thing in front of me. I started fresh with each map, and did not consult the previous map. I did not compare any published maps to my sketches as I was drawing or after I finished drawing. I didn’t draw the same area every time. During the first few days in a new place, I stopped studying the map as I did prior to arriving. I wanted to sketch a map that reflected what I could remember, instead of what the map actually looked like. I did have to look maps for planning daily journeys and on my phone while out on the street, but it’s harder to judge overall street configurations from the small screen. Street names throughout are inaccurate guesswork. I learn names much later, if at all, and I really only learn the few that are associated with stops on mass transit. Learning street names is complicated when you are dealing with a foreign language. After about two or three weeks, I found my maps became more detailed, but didn’t encompass new territory. My overall mental map would stay the same, I was just filling in with details. One odd thing I found was that my maps became less accurate after about two or three weeks. I would put things in the different places. I think this may be because I had so much new information, things I had internalized became less important to the act of navigating so they lost their position on the map. I knew they were there, but I didn’t need to use that information to get somewhere. Each map had a different concentration with a different set of elements, although “important” elements repeated across maps. As the density of the map increases over time, it becomes more than a picture. It captures a memory, in a way that a photo or drawing cannot. 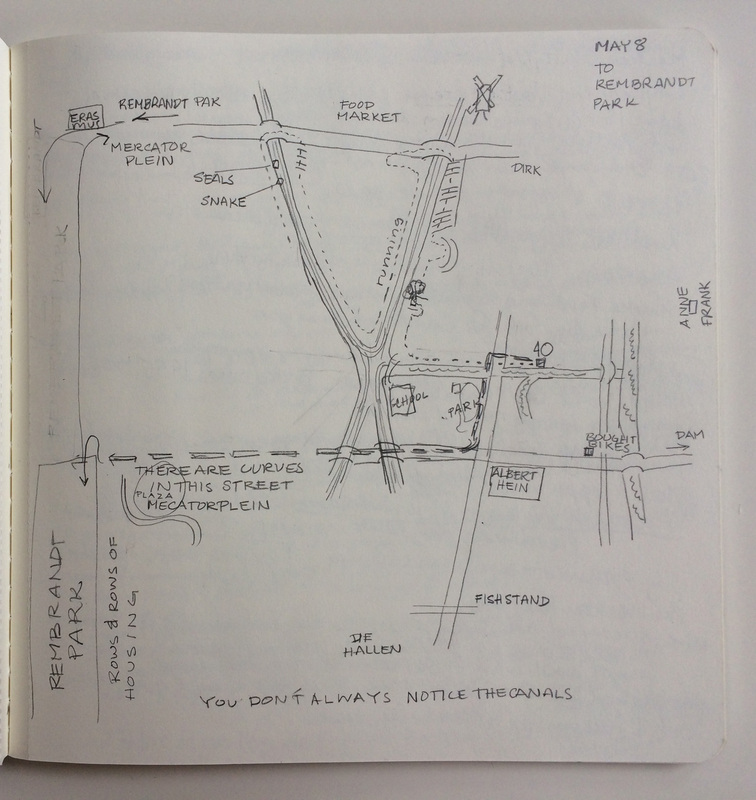 After I stopped drawing the maps, my mental map continued to develop. It became internalized and sharper and I could rely on it (most of the time). Within about two months, I can get to several places without consulting a paper or digital map. My journey is guided by subtle clues I’ve added to my mental map. Everyday journeys in each city have left a distinct image my mind. 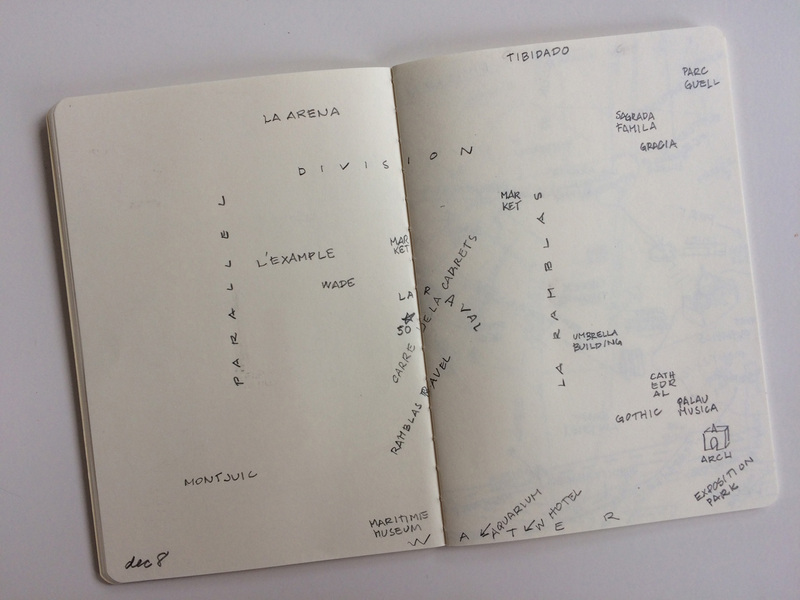 I started this experiment in Barcelona, a city I knew very little about. 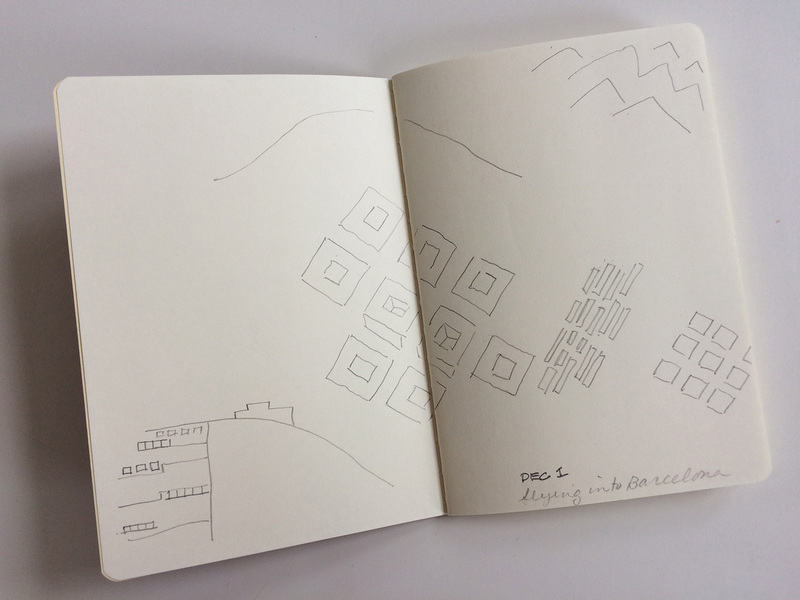 On paper, the city is a beautiful grid of squares, encircling the old town. It’s a very prominent visual, and I was excited to see the square blocks from the air as we flew in at night. (There happen to be some very nice souvenirs featuring the map, too.) I also recognized Montjuic, which was near us. 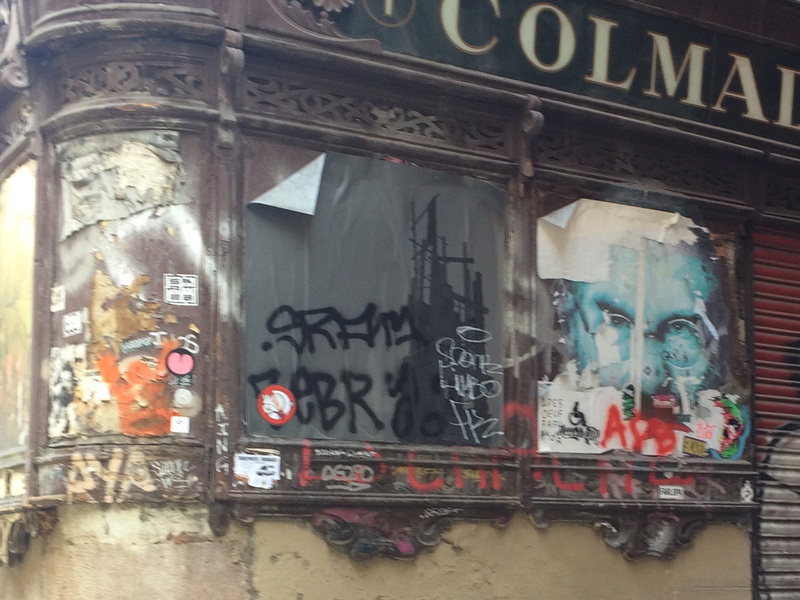 We stayed El Raval, a cramped maze of streets, a bit south of the old town. 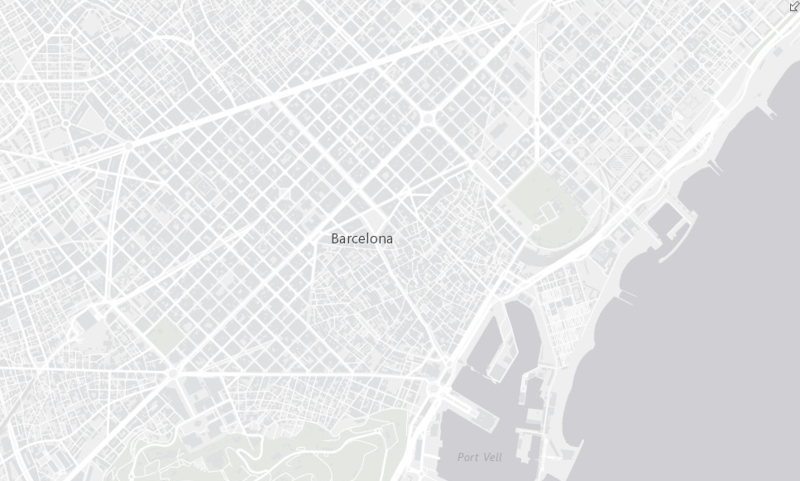 Barcelona has an interesting city planning history. The big square blocks were designed at the beginning of the 19th century as the city expanded. The square blocks are really octagons and have large inner courtyards, many of which are now filled in now with parking, schools, libraries or parks. 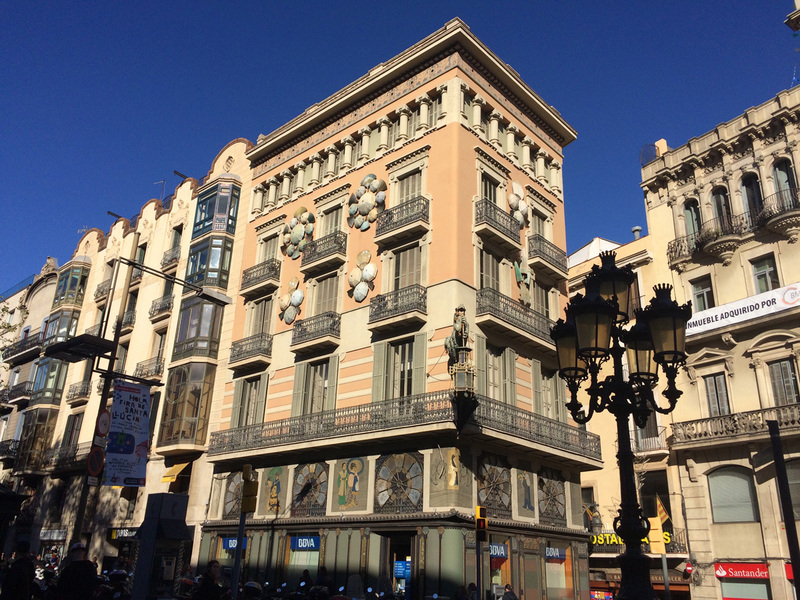 Avinguda Diagonal cuts through the blocks on an angle and Av. del Paral•lel runs on a true east west, parallel to the equator. The city is bordered by hills to the southwest and the northwest. Temple Expiatori del Sagrat Cor is perched high up above the city on Mount Tibidabo to the north (west) and is visible from many places. In Barcelona, I found I thought I was always moving on an “east west” path. It’s not really east to west, but it often looks like that on a map. The square street grid is on about a 45 degree angle to true north/south and is parallel to the sea. The map is usually oriented with the sea along the bottom of the paper and “north west” at the top. I tend to picture a map in my head as I see it on a paper map. I knew when I left the apartment, I would head “east” or “west” first. Strangely, I never came to understand which way the street “Paral•lel” was oriented. It’s completely wrong on all of my attempts. 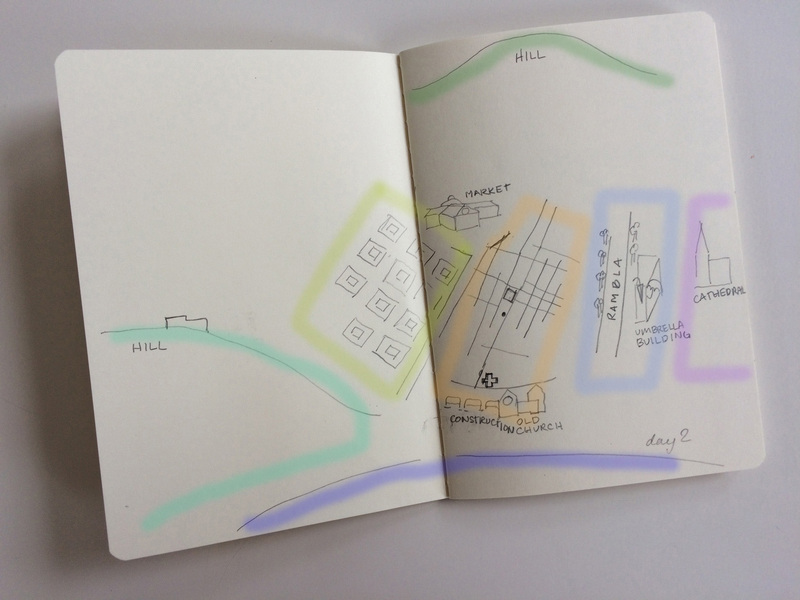 Day 1 – this is information recalled from looking at maps prior to arrival and what I saw from the plane. 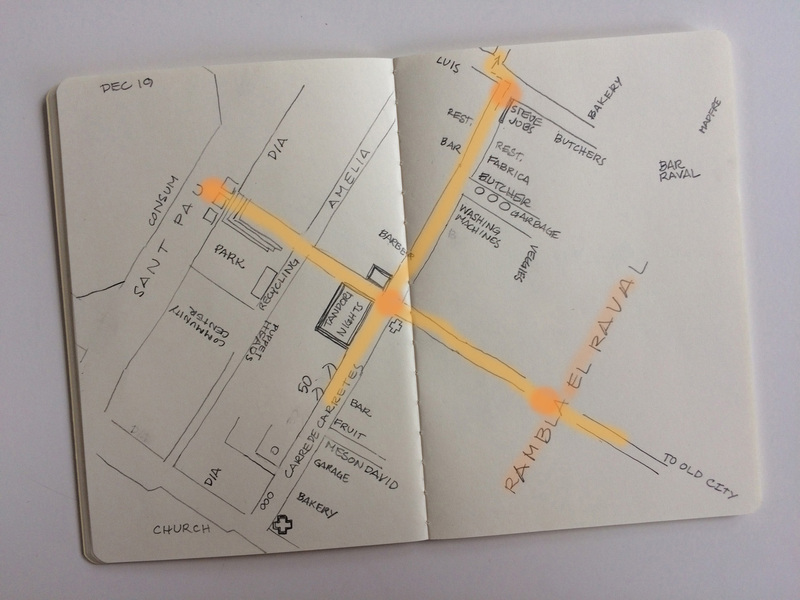 Because of the distinctive street plan, I tended to see Barcelona in sections from the start. The hills around the city were revealed as I flew over the city (you don’t really “see” hills on a map). Day 2, after much wandering around, I started to learn the different districts, shown in color for this post. The actual sketches do not have color. On the 6th day, we took a bike tour. This took us to all the major attractions in various districts, but not near our apartment. The tour was great for understanding the city overall, but didn’t help too much in navigating to/from the apartment. Two days after the bike tour, this is a schematic drawing of what I (think I) know. I had a good idea of where the bike tour took us, on the right side of the sketch. With this and the sketch above, I was experimenting with how to record my mental maps. Note: Diagonal is mislabeled at Division. Nineteen days in and I can label quite a bit of things in the city, but Paral•lel is really out of place. Also, Division should be Diagonal and Diagonal is Gran Via de les Corts Catalanes! Again, street names can be tricky when you draw from memory. After a month, Paral•lel is still out of whack-it does not intersect with Diagonal! But the rest of the city is shaping up. 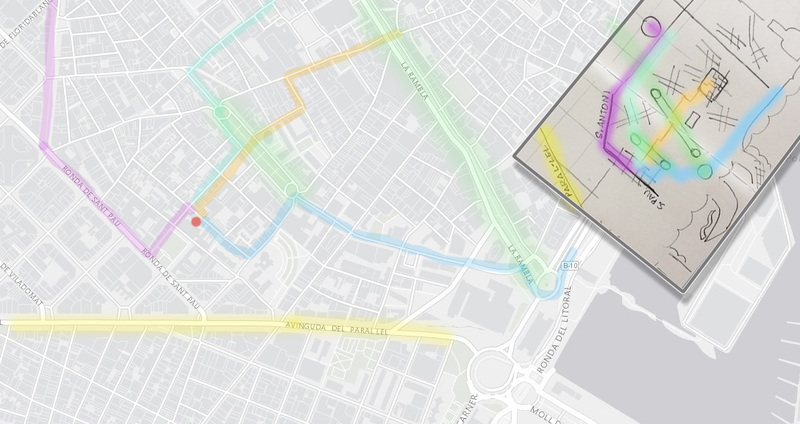 I am differentiating between the old city medieval street plan with hatch marks and the planned square grid of Eixample. 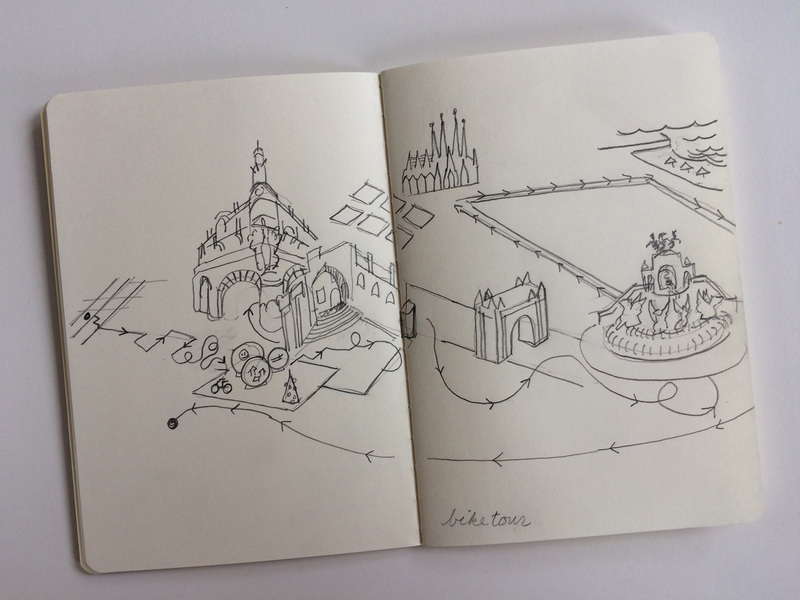 Comparison of “real” map and my Dec 31 sketch (inset). Paral•lel is in yellow at the bottom. Most of my treks lead to the “east” (north east). 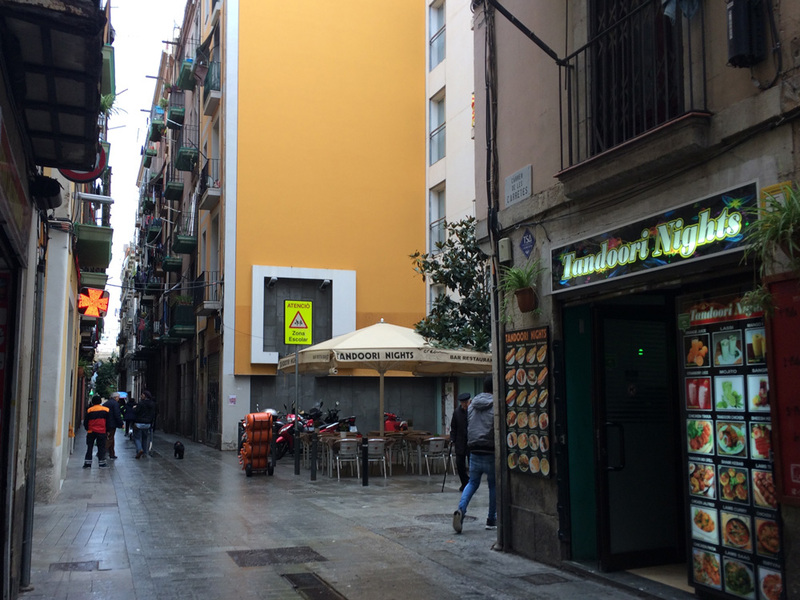 Some Barcelona landmarks: Tandoori Nights on our corner, the “umbrella building” on La Rambla and Steve Jobs at the other end of our street. Dec 19, detail of few blocks around the flat. Orange circles are nodes, where a decision of which way to turn must be made. I wasn’t the only one that could not internalize proper direction in Barcelona. I was told by a local that no one really thinks in terms of north, south, east, west in the city. When he meets friends at a cafe, they agree to meet on the “Mountain/River Besòs corner”, instead of trying to use cardinal direction. Barcelona is flanked by two rivers to the southwest and northeast just outside of town, mountains to the northwest and the sea to the southeast. Combine that with the large square blocks that run parallel to the sea, it’s just easier to use these landmarks, rather than cardinal direction. 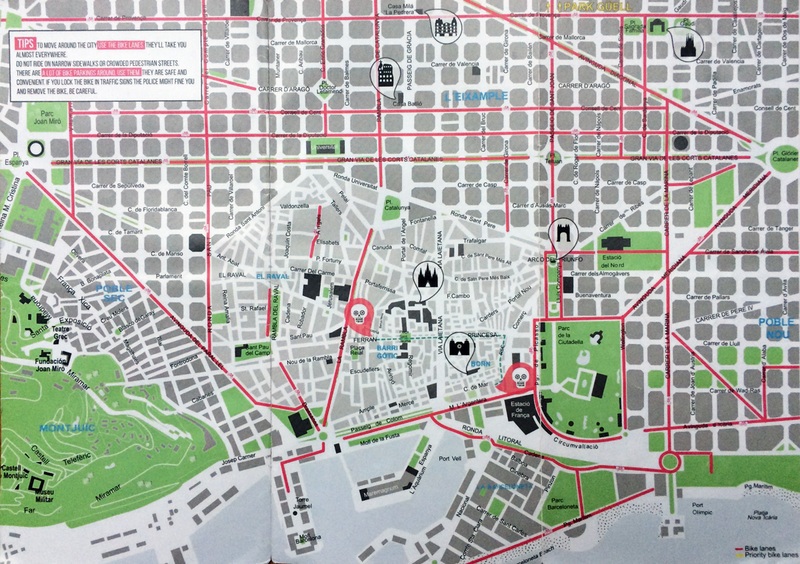 Bike route map of Barcelona with Eixample aligned to the paper. Aligning the city to the paper is typical. I remember being very confused in Dublin for many days. I couldn’t for the life of me understand the city. (I also happened to be quite ill for the first 3 weeks!) 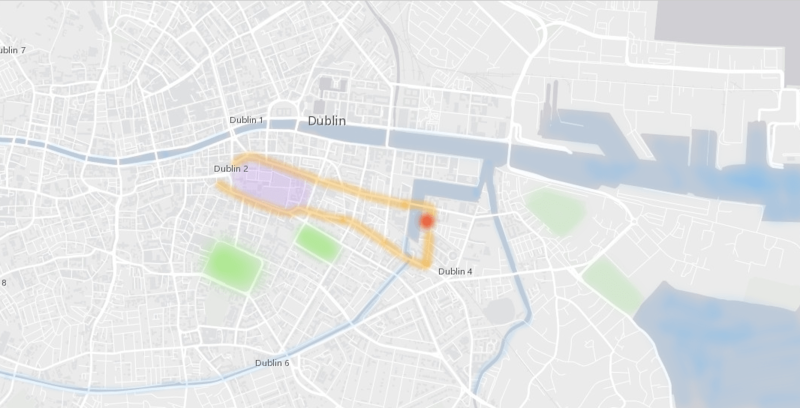 I just knew that if I wanted to get to Temple Bar or the city center, I’d have to hike around Trinity College, on very busy streets full of cars. There was also a lot of construction in the downtown area that limited visibility. Lynch (The Image of the City, 1960) speaks of being able to see an overview of where you are, from an open space. There really wasn’t much open space as you approached the city and I think this limited my ability to internalize directions. 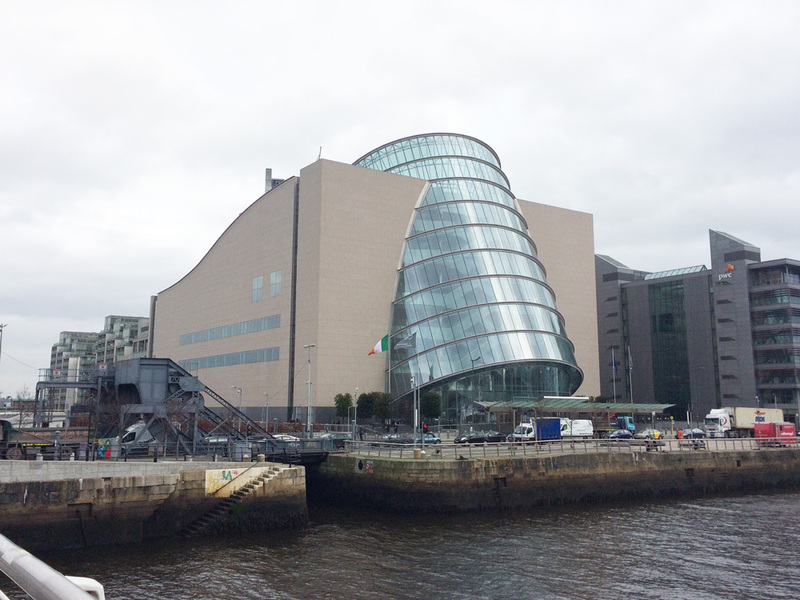 On a map and in reality, Dublin is a jumble of streets, yet the city has a strong east west orientation along the River Liffey. There is no rational street grid. Like London, not many of the side streets “go through”, so unfortunately, you had to always walk on the large busy roads to go any distance, at least to get out of Canal Docks. Turning a corner usually meant hitting a dead end. Nothing much stands out as a navigational aid except for the river and canals and the large boat basin we lived on. My main path to the city from the Grand Canal Dock area has Trinity College smack in that path. I viewed the college grounds as an obstruction I had to get past before I could “see” anything. 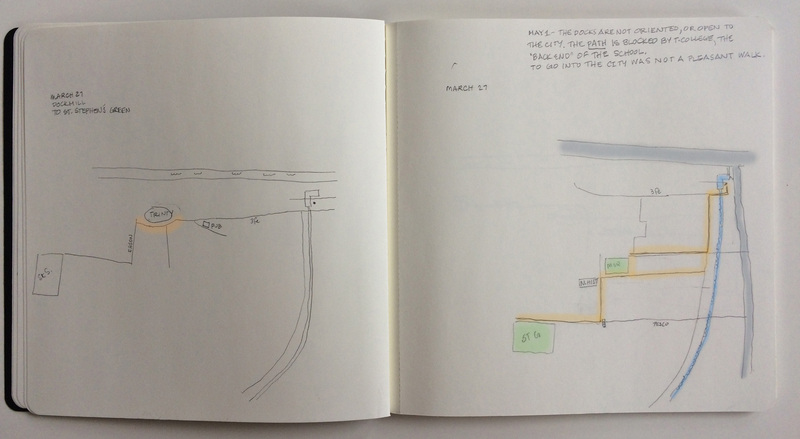 From these Dublin drawings, I realized how my first attempts to get from A to B were focused on the endpoint and not necessarily connected to the city as a whole. 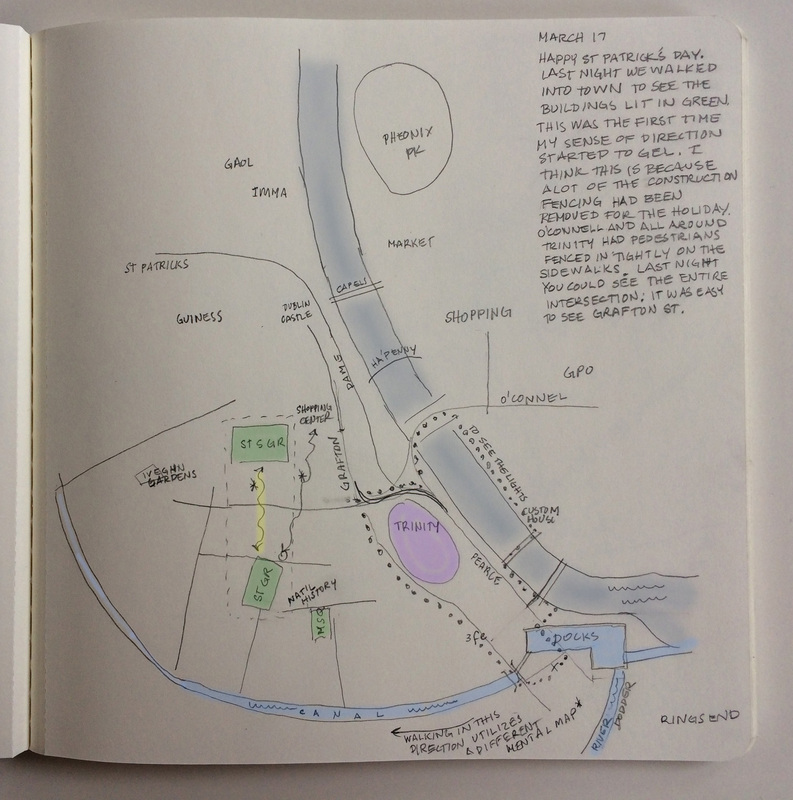 Below, my first map drawn after being in Dublin a couple of weeks, shows two St. Stephens Greens! At first I thought I should walk one direction to get to Merrion Square and I walk another direction to get to St. Stephens Green, but at the same time I knew they were close. 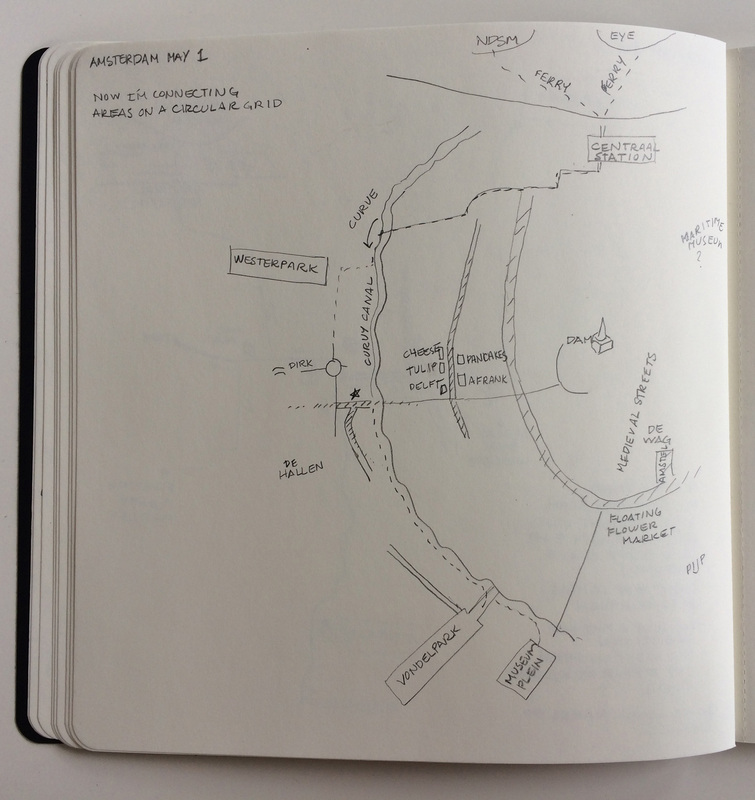 Thus I just drew a second one, as I tried to be true to what I recalled, as opposed to copying a map. The fact is, you could walk by Merrion Square on your way to St. Stephens Green. They were in the same part of the city. Over time, gaps in my mental map “close up” as the two parks connect In my mind. I reduced the instances of St. Stephens Green to one. add districts to this map????? Our apartment is the red dot in Grand Canal Docks. The orange are the paths blocked by Trinity and the green areas are the parks we went to a lot. Details: On the left, I show Trinity as a plug in my route, an obstacle with a curved line around it. On the left, I had mastered the connection between Merrion Square and St. Stephen’s Green and manage to get there without passing Trinity College. I spent a lot of time in Ringsend, just to the west of us. It was a charming neighborhood, with a better grocery store (Tesco) and nice parks. It was more pleasant than the city center. There was a tidal beach that you could walk on. Way out on the peninsula were the red and white striped Poolbeg incinerator stacks, They were our constant landmark. Once they came into view, you knew which direction to go. 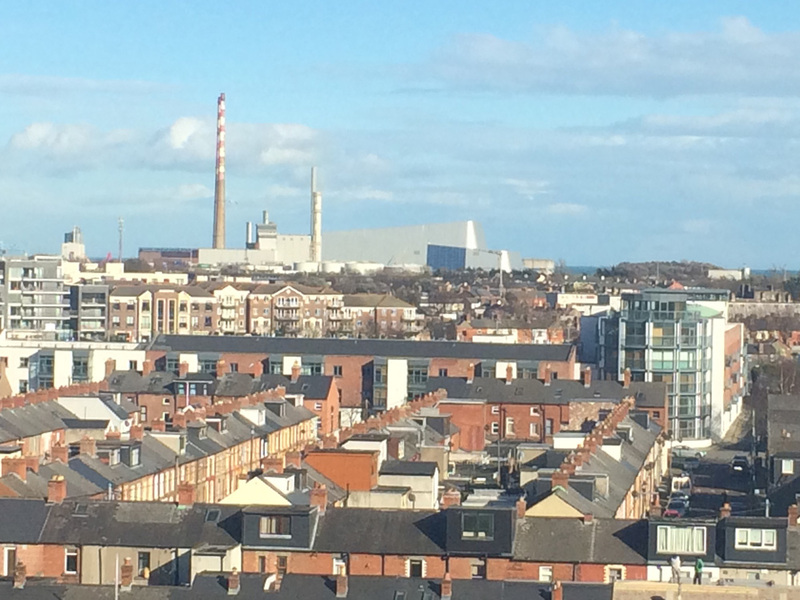 Dublin landmarks: One recurring landmark feature I’ve relied on in different cities is the smoke stacks. They tower above the buildings and trees and can be seen from a distance. In Dublin, the red and white Poolbeg stacks are tall and far enough out of town to be navigation aids to the east. The building in the middle was distinctive and I knew I had to pass it to get to my apartment as I walked east along the river. 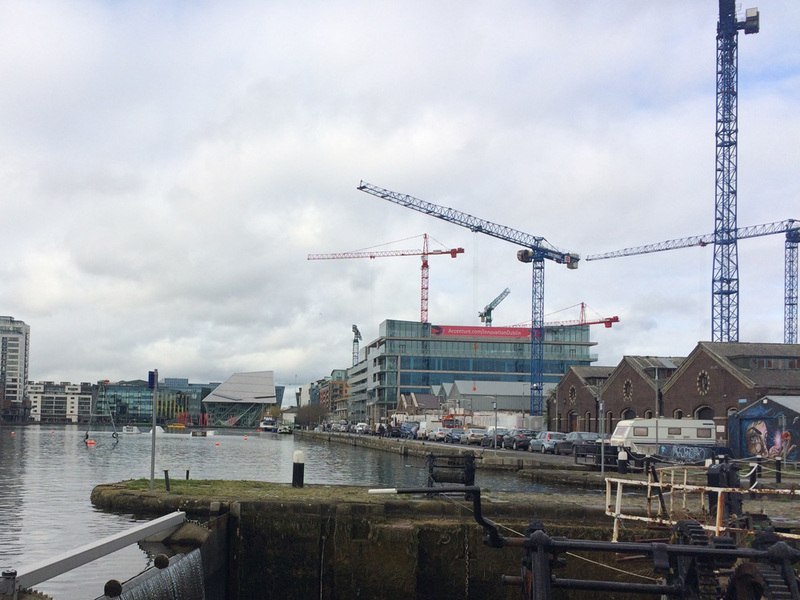 The Docklands area of Dublin had (too) many cranes, but they were good landmarks for our end of town. 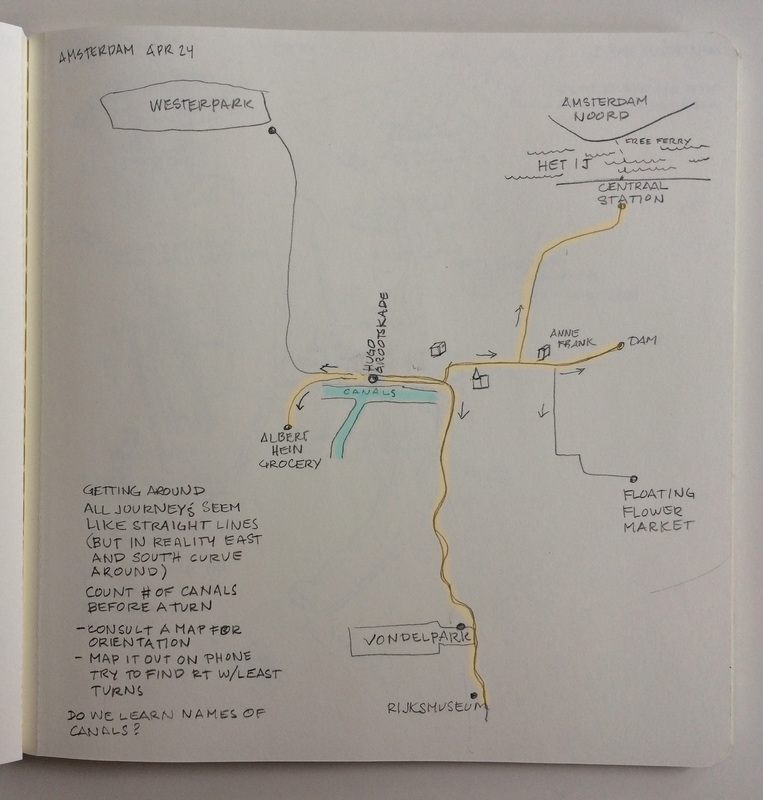 I got better at documentation of my mental maps by the time I reached Amsterdam. I had a better idea of what I wanted to capture. I wanted to record my paths and landmarks, as opposed to districts in the city. I also made notes at the time, which are interesting to read today. They form much of what I am writing in this post. 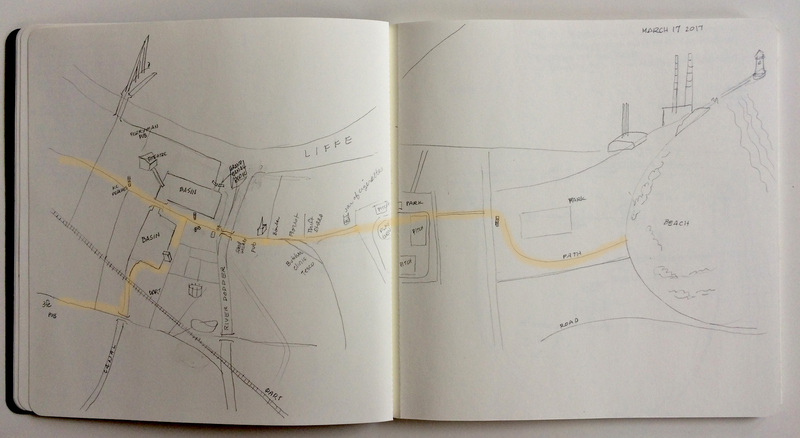 As you can see from the drawings of Amsterdam, the first paths were simple lines “from the apartment to X.” There are few landmarks or other streets along the way. The early paths radiate from the apartment, and have little relation to the actual plan of the city, but they are generally accurate in sequence. The drawing below was made before I internalized the semi-circular grid of the canals. Of course you can see them on a city map, at first, it’s difficult to relate to them on the ground. As time went on, I realized that if I followed one canal, that street would curve around and bring me to the Rijksmuseum and Vondelpark and then along to De Pijp. I tend to think of the ring main streets and canals as straight, as opposed to semi circles. Funny, we have a map of Amsterdam hanging in the apartment, but I didn’t help me internalize the “U” shaped grid. In fairness, it is a map from 1600’s, when they drew Amsterdam maps with the port to the bottom of the paper, opposite of how the city is drawn today with north, and the port, at the top. Map 1: Simplified paths from the apartment to a destination. This map shows how I connected our apartment with Vondelpark and the Rijksmuseum. Our apartment sits at the “T” of two canals. 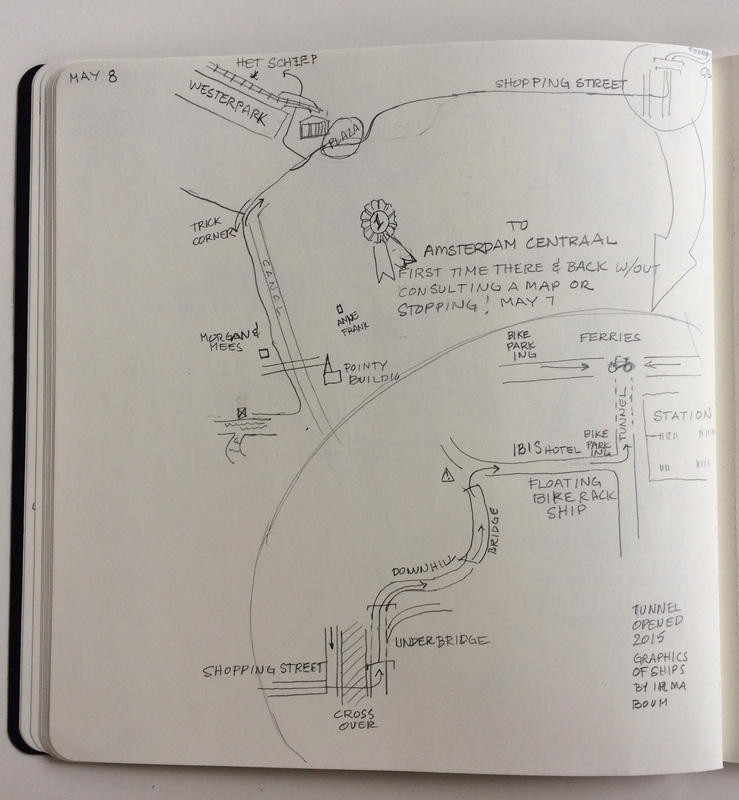 This May 8 map was drawn about 3 weeks after being in Amsterdam, after we had been many places in the city. What was a simple line to the train station on May 1 became quite detailed after several trips there. Our apartment was at distinct canal “T” intersection, so it was always easy to locate on any map. 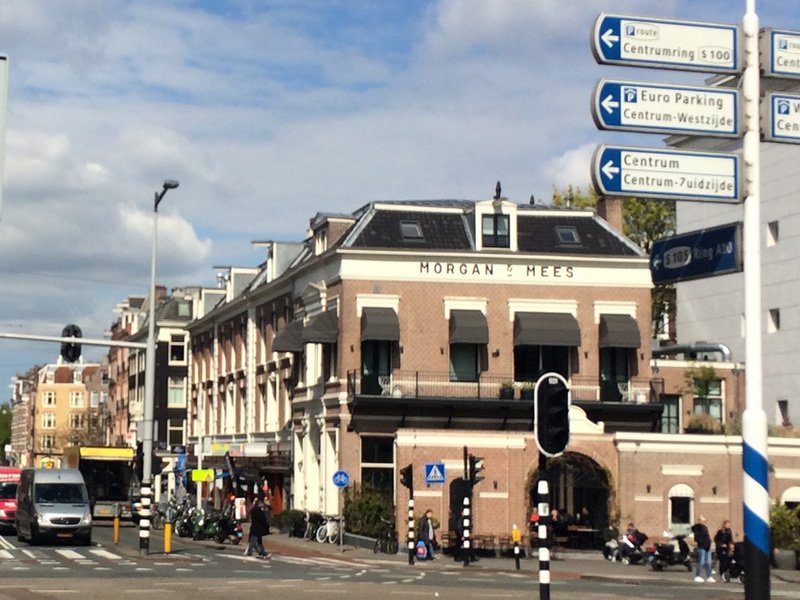 Here, I’ve filled in many details about the neighborhood, including the ever-so-important Albert Heijn grocery store. These maps lack scale and are drawn to fit the paper. The last Amsterdam map. After a few weeks, more details are filled in, but the overall structure doesn’t change. When planning a route in Amsterdam, I count canals and bridges before a turn. I haven’t really learned canal or street names, although I recognize many names that are associated with riding the tram – because you have to know when to get off! 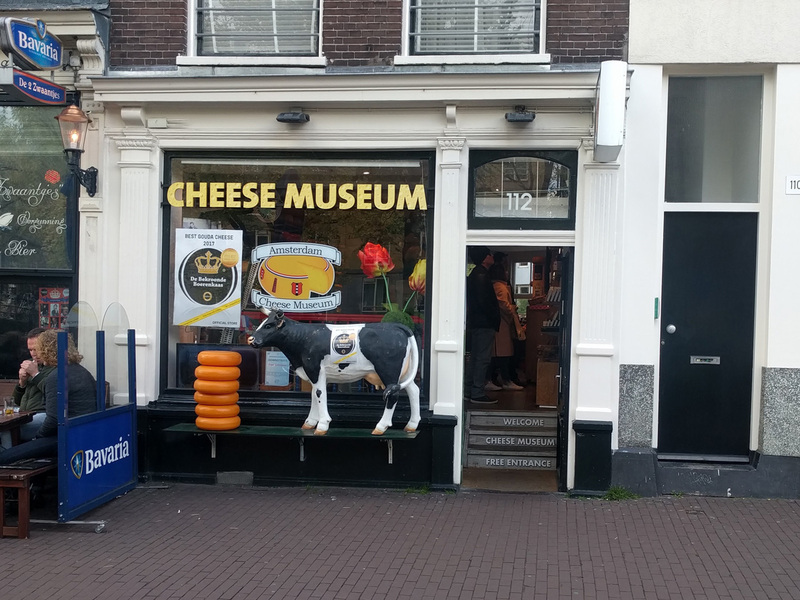 Amsterdam landmarks: The pointy former police building and Westerkerk, the Cheese Museum (the one near the Tulip Museum); Morgen & Mees. To make all the pieces fit together, eventually I had to study city maps again. 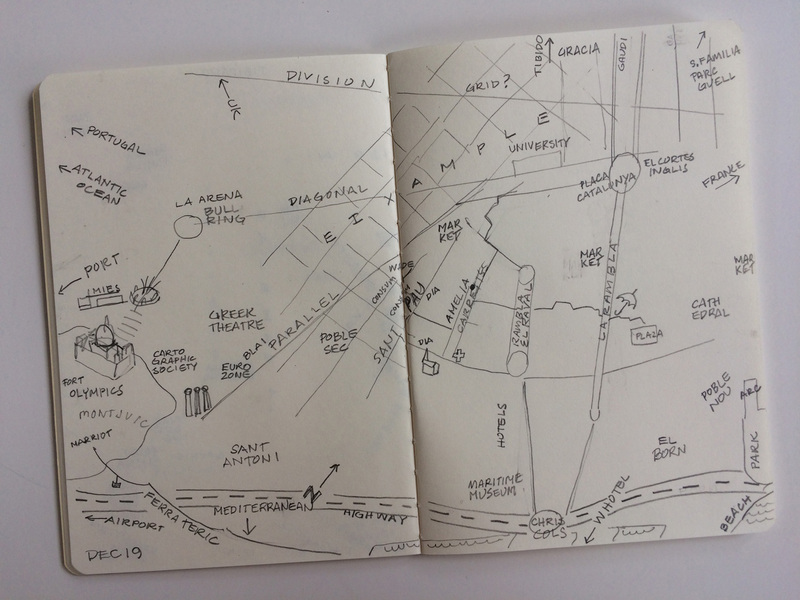 This is how I really became comfortable navigating a city-comparing my mental map to a published map. For instance, until I looked at an Amsterdam map, I didn’t realize when I was at the Floating Flower Market, I was very close to the Rijksmuseum. As with St. Stephens Green, I had envisioned these two places as being in a complete opposite direction. 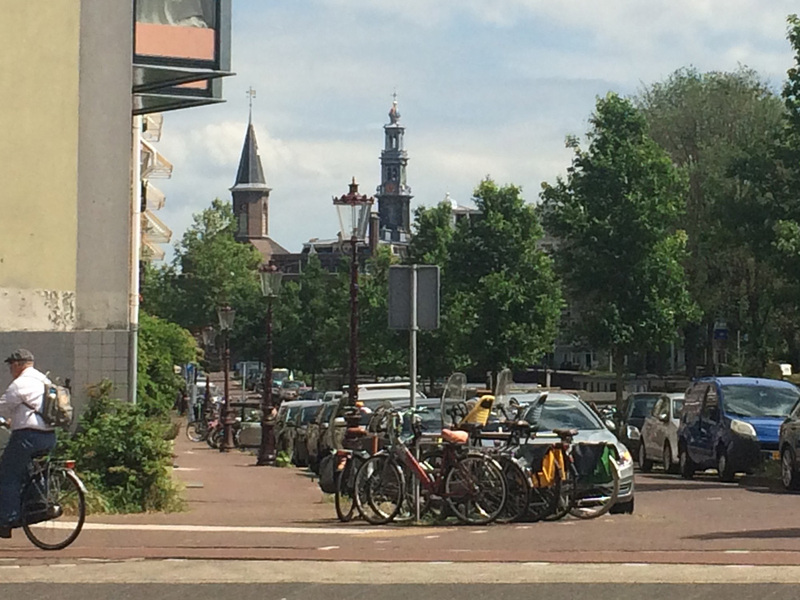 It took two or three weeks to internalize the semi-circular nature of Amsterdam to be able to make the areas connect in my mind. After a while the bits and pieces of the city come together and contract, like they did in Dublin. The holes in my mental maps become smaller. So now I have been in Amsterdam two months and three weeks. I am comfortable in knowing how to get somewhere – just in time to leave. I enjoyed creating these maps and researching the topic. 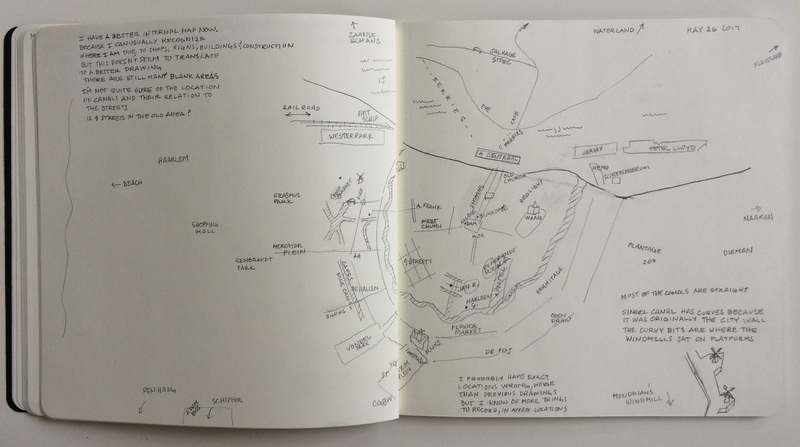 Perhaps I should request another sabbatical to live in more new cities so I can perfect the way to record a mental map! Read about my process and research here.